Nestled amidst the verdant greenery of Labrador Nature Reserve, Villa Samadhi offers a tranquil oasis hidden away from the urban bustle. 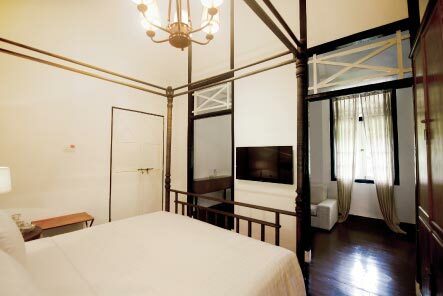 The 20-room boutique hotel is housed in a 1920s black and white colonial garrison, and continues to preserve an important legacy of Singapore's past. Encapsulating the quintessence of that bygone era, its interiors are an amalgamation of local and Western influences, recalling charmed lives of elegance and poise. 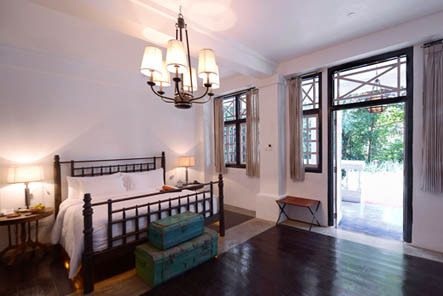 Furnished in harmony with its colonial surroundings, each of the hotel's well-appointed rooms is a paragon of charm and nostalgia, featuring lofty original ceilings that hover over custom-created teak furnishings and antiques. Every chamber offers a king-sized bed and individually-controlled air conditioning for optimum comfort. Modern conveniences include cable television, wireless Internet connectivity, while spacious bathrooms feature a rain shower, wooden baths and plunge pools. 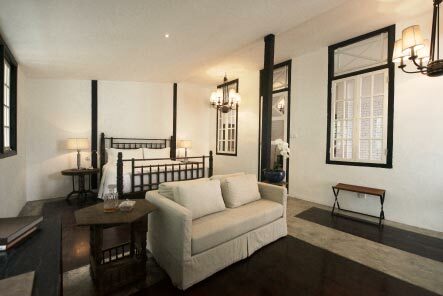 Retreat in comfortable and elegantly appointed Cribs, which provide a welcome retreat to the urban traveller. Adjourn to the private seclusion of the Luxe Crib, which offers an ideal blend of space, serenity and comfort. A haven of peace, our Sarangs are equipped with a private whirlpool for an added touch of indulgence. The Luxe Sarang offers the ultimate privacy, evocative of romance in the bygone era.